But forget the grand ideas — when we get into the details, what does it really mean? Corporate sustainability includes the financial, social and environmental impacts of an organization. 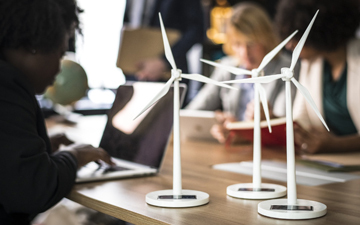 Ninety-three per cent of the world’s largest companies now provide sustainability reports to communicate how the firm affects these different areas. In France, many companies are required by law to provide audited information about its social and environmental performance. Here in Canada, many firms voluntarily provide such information. Accountants are skilled communicators and purveyors of details on how a firm is performing. This has traditionally related mostly to the financial performance of the firm, and involves the creation of financial statements. Accountants are also the go-to profession for anything audit-related, ensuring that the information faithfully represents reality. But would it surprise you to know that accountants are not being trained in sustainability accounting as they’re studying to become accountants? Sadly, this is the situation both in France and Canada. You’d be forgiven for thinking that Canada and France are more sustainable. After all, Justin Trudeau and Emmanuel Macron are champions of the Paris climate accord, and recently reaffirmed each country’s commitment to battling climate change. You might conclude from this that each country has established a strong sustainability infrastructure in many sectors to support these lofty goals. And yet, my recent research with Emilio Boulianne from the John Molson School of Business at Concordia University on France and Canada finds that students pursuing an accounting designation in either country will find little to no coverage of sustainability in their education programs. What are we to make of this? In our study, we examined the Canadian Chartered Professional Accountant (CPA) program. We pored over what’s known as the competency map that details exactly what the accountants are expected to learn in the CPA education program. When we compared this to international calls and recommendations for increased sustainability content in accounting training, we found very little. In fact, prior to the merger of the three accounting designations into the current designation, one of the previous accounting bodies actually had substantially more sustainability content. In the merger, however, this was mostly lost. In our France study, we worked with Maxence Postaire from the Toulouse Business School at Université Toulouse to examine how accountants are trained in France. We were interested in the French situation, because the government of France requires many companies not only to provide sustainability information, but also to have it audited. Given accountants’ substantial involvement in firm performance communication and audits, we thought we’d find more sustainability accounting in their professional accounting program. Sadly, again, despite calls for more sustainability in accounting, we found very little. So what’s caused these two situations to emerge? In Canada, we believe it’s due to the dynamics surrounding the competency map creation. If there is no one at the table with knowledge of sustainability, no one will push for its presence. Additionally, while accounting firms and corporations have representatives to speak on their behalf in the competency map discussions, who is speaking on behalf of the planet? In France, it appears that the cause is different. Education is paid for by the government in France, and while it demands sustainability reporting from firms and requires it to be audited, it does not provide the funds to pay for increased education in this area. Consequently, individual accountants are left to discover this knowledge on their own only after they’ve received their designation — and at their own cost (or their firm’s). As a consequence of the lack of coverage of sustainability, accountants are ill-prepared to face the growing needs of sustainability accounting. Governments and firms need high-quality information to understand the impact on society and the environment and, to date, we just don’t have it. How are we to understand where we’re at or where we need to go if we don’t have the information to make those decisions? The landscape in accounting is changing. Stakeholders, including governments and shareholders, are demanding more information about how firms are impacting society and the environment. Accountants have an opportunity to use the skills they already possess: measuring, evaluating and communicating firm performance. Doing this, however, will require a shift in how we educate our accountants. In line with international recommendations, we must make room for more breadth in our accounting programs. We must consider how firms have an impact on a variety of stakeholders. We must leverage accountants’ skills in measurement and reporting to understand where we’re at on sustainability. It’s time to dig into the details of what firms are doing on sustainability and how they can go forward. Accountants are ready to play an important role, but we must change our education system to include sustainability. By Leanne Keddie, PhD candidate in accountancy, Concordia University. This research was supported by funds from the CPA Research Centre in Accountability and the Manulife Professorship in Financial Planning at the John Molson School of Business.